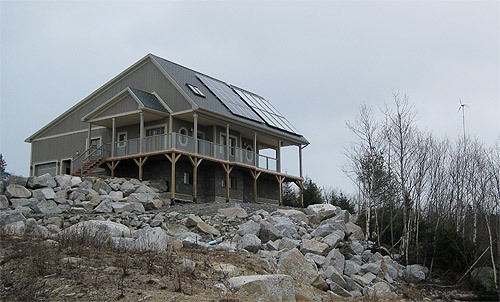 If you are looking at building your home off-grid or if you are simply interested in using solar or wind to power a weekend cottage, we can design and provide the system to meet your needs. We have designed and installed dozens of systems and have seen the mistakes commonly made. Let our experience benifit you. We will start with an assessment of your building plan and the life style you aspire to. Then we will specify the appliances needed that will most efficiently meet your needs. This will include lighting design, refrigerator, water pump, air handling, heating and energy management. If you are seriously looking at an off-grid project, give us a call. Click Here for an example of an Off-Grid Home.